PORT-AU-PRINCE – Loud appeals by Haitian electoral officials for calm and patience as vote counting continues have been falling on deaf ears, with political parties and citizens clamouring for the results of Sunday’s first round of presidential elections. 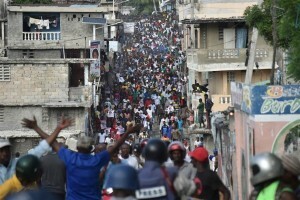 For several days, demonstrators have led violent protests on the streets of the capital, Port-au-Prince, clashing with law enforcers as some of the main political parties each claim victory. The Provisional Electoral Council (CEP) declared that the results of the poll would not be released until next Monday, and in a statement urged the public to ignore any premature victory announcements. More than two dozen candidates competed in Sunday’s vote where six billion Haitians were eligible to cast their ballots. The party of former President Michel Martelly, the PHTK, has already claimed victory for his successor Jovenel Moise. But the Fanmi Lavalas Party that is backed by former President Jean-Bertrand Aristide has disregarded the claims of its opponent, touting that its candidate Maryse Narcisse has already won the election. Both parties will also have to contend with another heavy weight, Jude Celestin. The top two finishers will meet in a run off on January 29, unless one candidate emerges with more than 50 percent of the votes.